The load gauges measure the actual pounds of force that the welder is applying to the parts being welded. It’s a must for insuring consistent weld pressure between machines. Because different welders have different size press cylinders, the same reading on the pressure gauge of each machine does not mean the actual down force is the same. 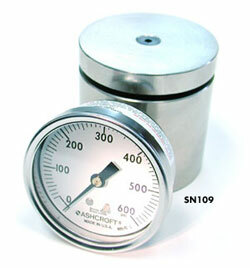 The Hydraulic Load Gauge removes the guesswork. Simply bring the horn down on the load gauge. 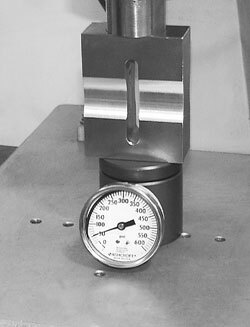 Then, adjust the machine’s pressure until you have the desired down-pressure reading on the load gauge. Do this on each machine to duplicate welding parameters. The load gage is a great companion to our amplitude gage, which together can take the guesswork out of accomplishing consistent welds. At less than half the price of a load cell, this gage can soon pay for itself in reduced scrap parts and setup costs. The gage is available with a 0-160 lb., 0-600 lb. or 0-1500 lb. indicator. We recommend the 0-600 lb. for 20kHz & 40kHz welders and the 0-1500 lb. for 15kHz welders or high-pressure welding applications. This image is demonstrating how the actual force from the ultrasonic welder is being measured by Toman Tool's 600 lbs.Load Gage.